The District of Hope, BC played host to the first adventure race of the Western Canadian season as 29 teams from Canada and the Western U.S. arrived in town, squeezed into their gear packed vehicles, ready to take on the rugged terrain of the Fraser and Coquihalla river valleys. The steep and verdant cliffs above were shrouded in fog as teams checked into registration and went through final gear checks in preperation for the midnight start on Friday. Under a clear, star-filled and moonless night sky competitors assembled at the race start, just above the Zopkios Ridge Rest Area, northeast of Hope itself. On hand for the race were a couple of well known teams; Spirit of BC and Ontario as well as international competitors Team Subaru Canada, based out of the Vancouver area. There was a collection of first time adventure racers rubbing shoulders with the more experienced teams and all were eagerly awaiting the start. Team Jam Cabins was entirely comprised of the Cadden family, out of Salmon Arm, BC, and Team Sudden sCrape, with a core group of female firefighters from Calgary, were also out for their first event. Other teams of note included previous Raid the North competitors and the experienced adventure racers of Teams Wild Rose of Calgary, Ecospirit-Typhoon from Vancouver, Steeps Tea from the Edmonton area, as well as RacetheRockies.com and Inner Limits, both from Calgary and the Bow Valley region. At the stroke of midnight the teams were let loose and swarmed across the snow crusted field, hurdling a creek and disappearing into the dense forests of the Coquihalla Valley on a quest for the remote CP1, 8 kms away - the bobbing of 116 headlamps was quite the sight from the clearing. 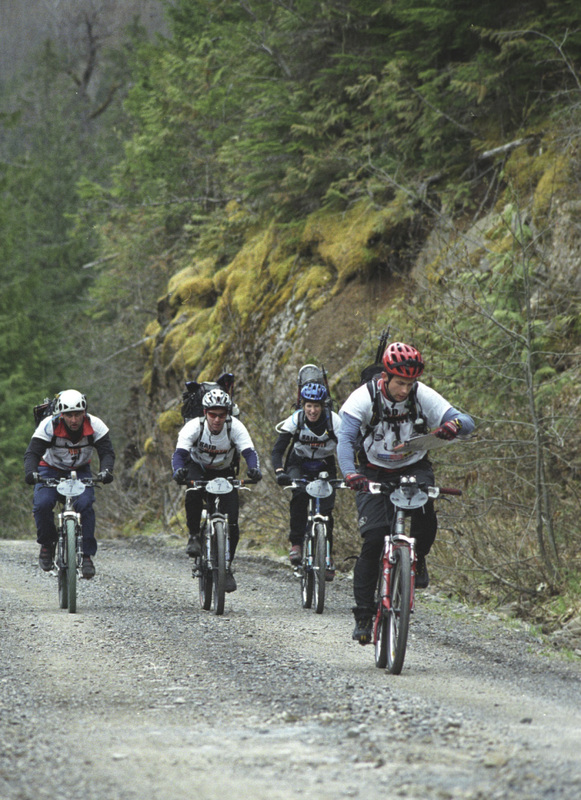 The first team to CP 1 was Wild Rose, at 2:17am, followed closely by Spirit Canada at 2:22 and the frenchmen of Washington's Team Dirtworld Adventure Racing, half an hour later at 2:54. The competitors trekked through the trees to the second CP, another 12 km's away, picked up their bikes at this remote drop point and mountain biked onward towards the Fraser River Valley and CP3 of the race, which was also the first TA - where teams are able to connect up with their support crews and switch gear, grab food or warm up. First to reach this point, just ahead of the second and third place teams, was Spirit Canada, having passed Wild Rose on the section, who now trailed the leader by scant minutes. Chasing, and right behind were the hammerheads of Team Dirtworld Adventure Racing, in their element on the bikes and closing. The rest of the field came through over the next day, some of them camping out at this area and waiting for first light to push on, with the CP finally cleared of all teams by just before noon the next day. By CP5, which saw teams mountain bike and slog through some extremely rugged terrain with their bikes on their shoulders, Team Dirtworld Adventure Racing, at 12:24 was in the lead with Spirit Canada only 5 minutes back. The scramble with bike stretched the race field out, putting distance between a lead group and the main feild behind, struggling to negotiate the terrain. CP5 was situated next to a beautiful natural hotsprings and campsite which was reachable only via a 4X4 truck. As soothing as it would have been at this point, none of the teams enjoyed the springs - all of them spinning right through the CP, stopping only long enough to scrawl out a signature and then burning off down the track, dropping in altitude rapidly, and hopping the huge drainage ditches that were around every wind and bend. A couple racers took some spills but there were no injuries aside from some road rash and banged up limbs. Wild Rose came through the CP in third place at 13:09. 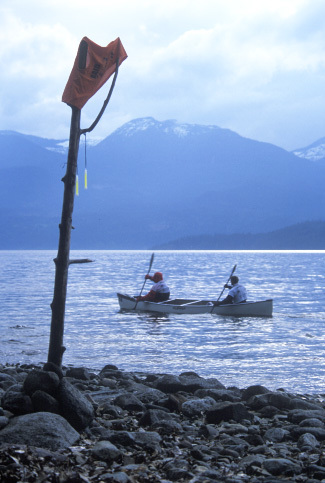 Lake Harrison was choppy as Raid the North Hope teams passed into CP6 and the second TA to get geared up and ready for a 30 kilometer paddle through open water with a rising wind starting to come hard at them from the south. The TA was situated on a long beach behind a group of tall, evenly grouped decidious trees. Racers would come through a few single track trails in and between the trees before descending right to the beach were there was a small village of tents, vehicles and support crew members prepping and cooking. Most teams took some time to rest up and eat some 'real' food, having likely gotten by on power gels and bars or other packable trail foods to this point. The paddle to CP7 looked a little daunting with the wind swirling up some whitecaps as darkness creeped closer and closer. Neither intimidated nor interested in stopping was Team Dirtworld Adventure Racing, first into the CP and, following the light 'n' fast credo, stopping only for a few minutes and then embarking in the two canoes each team used right away, paddling facefirst into the increasingly strong wind. About halfway up Lake Harrison sat CP7, 14 kms away from the beach of CP6. Team Dirtworld and the capable paddlers of Spirit Canada arrived neck and neck, stopping only to sign in, passing off the chance to warm up by a fire sparked up volunteer checkpoint staff. Both lead teams paddled off into the distance, shivering and wet but telling safety boat staff and checkpoint staff that they were "ok". Keeping the heat on the lead two teams, Wild Rose canoed into the CP a half an hour later, followed by RacetheRockies.com and Team Subaru Canada not far behind. It was 3 hours before, and into darkness, by the time another team came through the checkpoint, paddling into the night. Burning biceps and lats were rested as quads and hams came into the race again as Raid the North Hope passed through CP8 at Green Point, requiring competitors to swap paddle and boat for helmet and bike. With headlamps on the top three teams, unchanged in order since the last CP, rode away on a brief 7 km spin before leaving their bikes and trekking. The remainder of the race field gradually trickled into the CP, cold and wet from a night paddle on choppy waters. Many teams elected to stay at the CP for half an hour or more, hooking up with support teams for a warm-up and change of clothes. Team Valhalla Pure of Red Deer must've felt the allure of Harrison Hot Springs, some distance down the coastline, as they just kept on paddlin' right past the CP and into town, where they radioed in for help and a pick-up, out of the race at 05:15, cold and exhausted but certainly the toughest paddlers of the weekend! Just before dawn the radios issued to race staff and volunteers crackled into life after a fairly quiet evening, a cold rain had started to fall on the Hope area and was picking up in intensity. Teams had been on the course for about 32 hours and were tired, hungry, and now soaked. Hypothermia seemed close at hand for some teams, but all that called in were plucked off the course safe and shuttled back to the base at the Hope District Rec Center for some dryness and warmth. At CP9 the race had split into two options for teams, to take a regular course which involved an on and off road trek through to CP10r at Camp Hope, or a shorter, uphill scramble to CP10a that culminated in a breathtaking rappell down a 200 foot drop at CP11a, about a kilometer away. Teams that elected on the advanced option and passed it, would automatically be ranked higher then regular option teams, regardless of time. 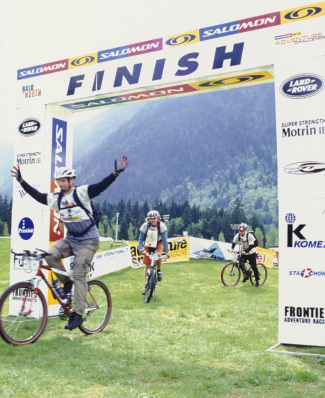 The race changed dynamically at this point with the two lead teams, Spirit Canada and Dirtworld Adventure Racing both withdrawing from competition, leaving it a race between the former third and fourth teams to decide the overall winner. Dirtworld AR radioed in for pickup at 5:05, declaring mild hypothermia and some team issues as to the reason behind their withdrawal. Soon after, at 5:48, Spirit Canada called in for the same, unsure of their location, tired and cold. Teams still in and going for it on the advanced course included Subaru Canada, Wild Rose and RacetheRockies.com, through at 6:56, 7:18 and 10:30 respectively. Regular course racers through were Ecospirit-Typhoon and Washington Adventure Racing. Camp Hope was the scene of the final CP and a switch to mountain bikes. The three teams through; Team Subaru Canada at 9:26, Wild Rose at 11:27 and regular course racers; Fudugazi at 11:26, Washington Adventure Racing at 14:03 and Ecospirit-Typhoon at 15:15 leaping on their wheels and strapping helmets on as they sped off for the town of Hope and the finish line. Team RacetheRockies.com and the remainder of the field had no chance to reach the finish by the cutoff time of 12:00 and were classified as DNF. The rain had cleared, the mist had lifted, and the sun came out just in time for the race finish. Victory at Raid the North Hope was awarded to Jim Mandelli, Danny Suter, Sheri Foster, and Mike Wardas of Team Subaru Canada at 9:52, after nearly 34 hours of racing. The winners were awarded a prize of $1,000 CDN in cash and an entry to the Raid the North Championship to take place in Mattawa, ONT in September. Awarded to them at finish were bright gold "Hope" competitor's bibs, as a memento of the weekend and their first place efforts and also to be worn at the championship race should they enter. Each winning team of the remaining Raid the North races this year will recieve similar 'Golden Fleece' bibs, marked with the race that they won them in. Wild Rose came in behind the winners, dramatically just before the 12:00 deadline for official finishes, at 11:51. Third place was Fudugazi, also just inside the cut off and only a minute behind, at 11:52, having battled adversity and willed it out for the entire 36 hours to move up the rankings. The second and third place teams each received invites and competitor's bibs for the Mattawa race as well - red and blue respectively, so look for those bibs, gold-red-blue, if you are in Mattawa for the Championship! The next race in the Raid the North series will take place in Parry Sound, Ontario on May 31. Check it out online! The master tracking sheet of all teams into and out of each CP is HERE. We will post a more focused breakdown of this data soon. Thank you for your patience.